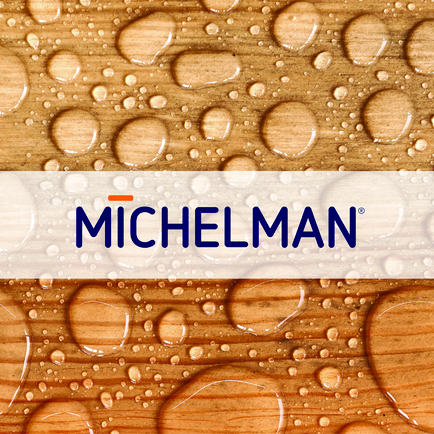 Michelman’s new Michem® Wood Coating 44 is a water-based surface additive for use in exterior wood stains and sealants that helps produce wood coatings with excellent weatherability characteristics. This topical wood treatment is a low-VOC and environmentally responsible solution that imparts outstanding water beading, along with outstanding water and swell resistance. 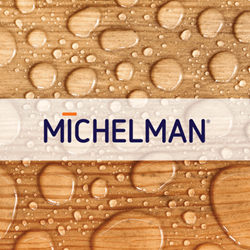 Michelman’s new Michem® Wood Coating 44 is a water-based surface additive for use in exterior wood stains and sealants that helps produce wood coatings with excellent weatherability characteristics. This topical wood treatment is a low-VOC and environmentally responsible solution that imparts outstanding water beading, along with outstanding water and swell resistance. Michem Wood Coating 44 penetrates deep into wood substrates and is user-friendly posing no re-coatability issues, so a second or third layer can be easily applied. With its superior water-resistant properties, the new additive improves surface aesthetics by slowing mold and fungal growth, and improving color integrity. Michem Wood Coating 44 also produces a pleasing, natural surface appearance and is particularly suitable for softwood as well as extending the look and use of outdoor wood furniture. Michelman will introduce Michem Wood Coating 44 at the American Coatings Show 2018 being held April 10-12, 2018 at the Indiana Convention Center in Indianapolis, Indiana. Mr. John Jacquin, Michelman’s Technical Service & Application Development Manager, has a product presentation on April 10th at 2:40 pm, outlining its benefits and uses. Visitors to the show can learn more in Michelman’s booth #749.